Let me introduce you to Garden. She is a 12" square wall quilt. On the front there are appliquéd bits of green solids - I am not sure what kind - and Kona white. She is densely quilted with an ivory white Superior Threads King Tut thread. I made the stem motifs on small pieces of white before I was sure how this little quilt would emerge. So I then arranged them and pieced in the rest. In hindsight I could have arranged it all on a single white background but that was not my process. In fact, this quilt was really hard to make for me. It is part of a challenge in a group called Four-in-Art set up by my internet friend Elizabeth who blogs at the Occasional Piece - Quilt! When she mused about the group I joined but when the group adopted "art" in their name, well then suddenly it became hard as I quilt, I don't do capital A art. But I am giving it a go anyway. 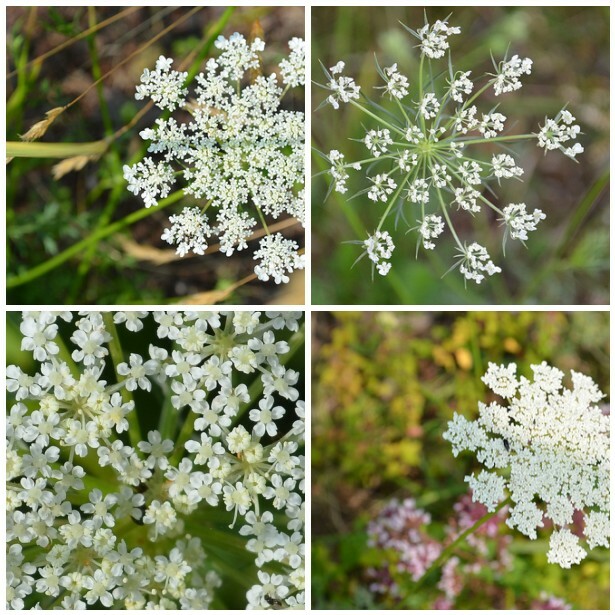 The challenge was to make a 12" square quilt inspired by the theme Queen Anne's Lace. I have a lot of Queen Anne's Lace in my garden on the coast and enjoyed it all summer. But as a quilt, well, I just put it all off until it was due - and the due date would be today. 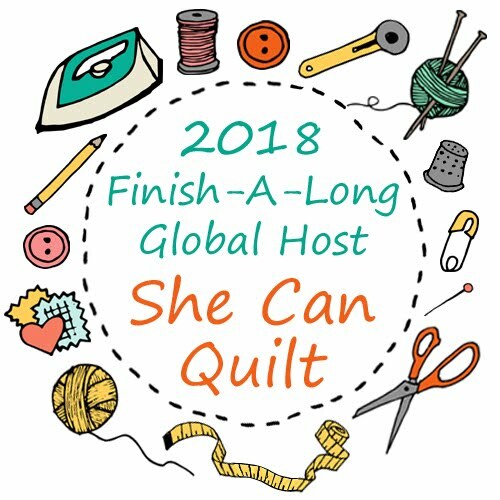 The challenge group does not share as they go and for me that is perhaps even more challenging as I like the energy and feedback from my internet friends as I move through the quilting process. This week I was sitting on my bed thinking and looked up at atmosphere. which is hanging on my wall. When I made atmosphere. I planned to play more with the concept of less is more and with negative space in small quilts, all inspired by Yoshiko Jinzenji, who wrote Quilting Line + Color. So I looked again at the photos I had taken of my flowers. And then I got to work. And finished yesterday. There is an evening photo before I washed this quilt. I always like to remind everyone how much texture is added when you wash a mini quilt. Since I planned the texture, I washed and dried her in a nice warm dryer. Here is her back, although the next picture is a better rendition of the wonderful olive colour of the Essex linen I used. The white piece is a serendipitous event. It somehow got added in the process and I did not notice it until it was fully quilted in. Somehow it was added totally smoothly without any applique or attention and stayed that way through all the turning while quilting. The back is my favourite side. 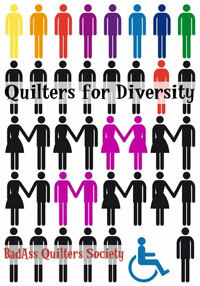 You can check out the little quilts of the rest of Four-in-Art group: Elizabeth, who blogs at Occasional Piece - Quilt! has shared her quilt and also Betty's who does not yet blog, and Rachel who blogs at Life of Riley will be sharing her quilt too. 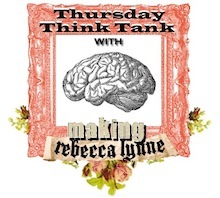 And because this story had some thinking in it, I am linking to the Thursday Think Tank at Making Rebecca Lynn. Great post. And I totally agree about the word 'art.' 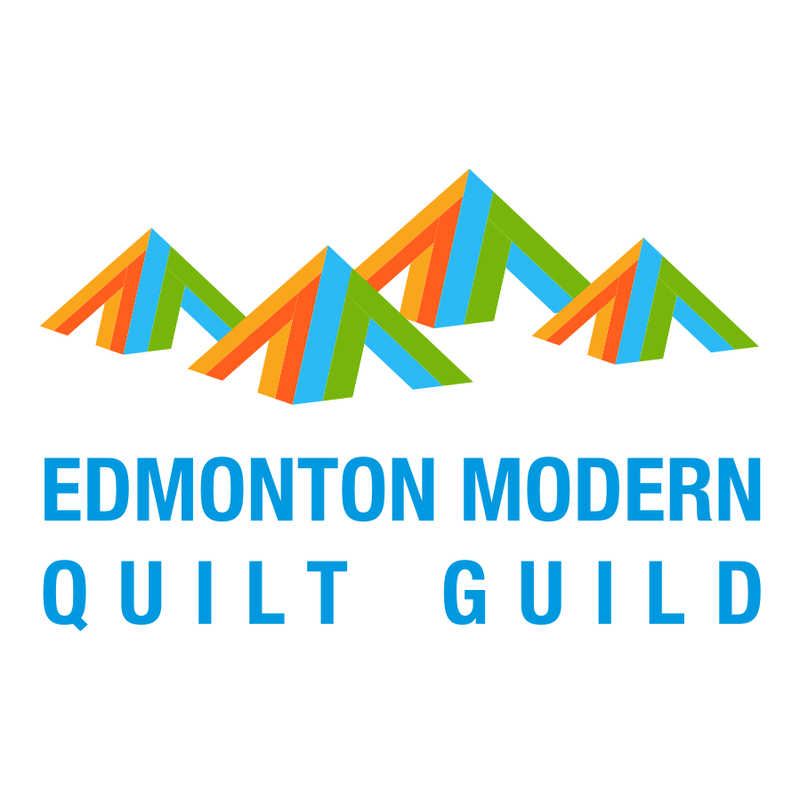 I just make quilts!! Wow - love your process posts! And I would have been daunted by the capital 'A' as well! But love your rendition of the subject. Love whatever happened on the back, and your quilting, well that totally makes it. It's a marvellous quilt and I love how interpreted it. Basically colourwise the otherway round; i.e. red flowers on white background. How cool! And the unexpected back is just great. Sometimes I'm with you - the back is just as great as the front! You are so not allowed to stop. I Love this quilt. Wow, Leanne! It's definitely Art. Beautifully done. Only you could make the perfect mistake! The back looks fabulous for that little accident. 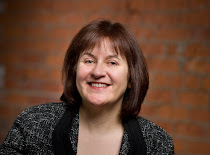 I really like how you have explained your process and inspiration Leanne. I think you will have a stretching time with your Four in Art group - good to challenge yourself. You are totally capable of this one. oh, my!!!! totally gorgeous! And I'm smitten with that white addition to your backing, how amazing! Even your 'mistakes' are marvellous! It's a stunning quilt! Leanne, I'm with Rachel - you can't stop now - you so nailed this! Love the back and that it wasn't intended makes it even more special. The circular quilting is outstanding. How cool. Wow, I love the simplicity of the design but the quilting just makes it completely amazing! And I love the white square on the back, it looks perfect! I own your Art tote! So I love anything you create... And I agree with Archie- even your mistakes are artistic! I have seen what this amazing group have been making...it is a wonderful collaboration! I was going to say I love the back you planned, then I read the words. If that's how your mistakes turn out, wow...you are an artist with a capital "A"
Fit for a queen! Luv the whole concept. I couldn't believe this was 12" - that is an amazing amount of quilting in a small space, and it totally works. ART is a scary word. I think you rocked the theme big style with a capital A for art quilt! This quilt is stunning. Both sides. I love the serendipitous little white block on the back. I love the story behind this! And it turned out beautifully. Thanks for sharing. I definitely want to try that circular quilting at some point too. Since I'm all turned around, time-wise since I'm traveling, I not only had the pleasure of reading about your magnificent quilt, I also had the pleasure of reading all the wonderfully supportive comments from your readers. I LOVE your quilt--it is so "Leanne" which is the best compliment I can give. I really enjoyed the story (yes, mine is coming later, as I originally had it on the same post but when Betty needed space, I had to change some things around), but I think your interpretation is inventive, and oh, so creative. I have a post coming in a couple of days about art and craft, and I think your process is an especially vivid example of art. I won't go on and on here (should figure out how to log onto Flickr from my iPad!) but Leanne, it's wonderful, from front to back. I am with everyone else--think the back with its hitchhiking piece of fabric,and the front, with the flowers strewn across a field of white--is capital A, Art! I like the back too. And it has a great story. Wonderful piece. Thanks for sharing the process with us too. Sometimes I just look at a quilt and think how in the world did they come up with that (in a good way). It is good to know the background behind the quilt. Love it - I thought it was pieced at first. You know green always does it for me. Beautiful quilts Leanne and I love quilts with lots of negative space. p.s. this would be a perfect entry into QuiltCon's quilt show. Modern in Miniature category. Love this so much! I find I pretty much love anything you make. I love the simplicity as well as the quilting. They just go together so perfectly. Wonderful work as always!! I quite like that quilt back! The leaning white sets the green off perfectly. Well done on the whole thing! Leanne, for some reason I'd completely missed Garden and Atmosphere. 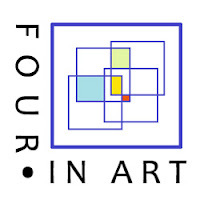 Can I just say that you are doing an amazing job of linking your group themes and the result will be a wonderful collection of related art quilts that tell a wonderful story! These are quietly beautiful and lovely to look at. Congratulations on your thoughtful work.